Bus from Kuantan to Muadzam Shah is one of the important transportation option to travel from Kuantan to Muadzam Shah. Many people especially working adults and students rely on this convenient bus service from Kuantan to Muadzam Shah. The reason is because Muadzam Shah is known as a fully established educational centre with many quality universities and polytechnics. Cepat Express is the one and only bus operator supplies bus service to Muadzam Shah from Kuantan. There are total up to 4 daily departures from Kuantan to Muadzam Shah. Cepat Express is a well-known bus company which deploys 30-seater VIP coach to serve the passengers. VIP coach offers spacious leg room and spacious seat for passengers during the journey. The earliest bus goes in the morning 9:00am. The following bus schedules are 10:30am, 1:00pm and 4:30pm. The duration required from Kuantan to Muadzam Shah by bus takes about 2.5 hours. The travelling time is depending on the road traffic condition. Passengers can request for washroom break from the driver during the journey. Please note that all the buses in Malaysia have no toilet on board. The bus fare from Kuantan to Muadzam Shah is RM 10.00 for adult and RM 7.50 for child. The boarding point in Kuantan is at Kuantan Sentral Bus Terminal located at Bandar Indera Mahkota. The arrival point in Muadzam Shah is located at Muadzam Shah Bus Terminal. 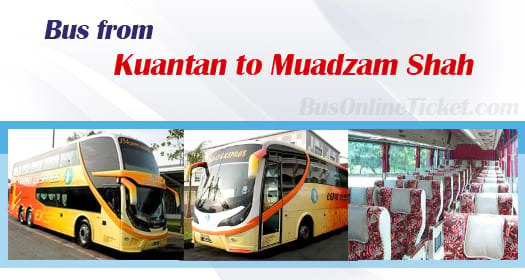 Due to limited schedule from Kuantan to Muadzam Shah, passengers are advised to book bus ticket from Kuantan to Muadzam Shah online at BusOnlineTicket.com to secure the seat. With the convenient and reliable booking service, BusOnlineTicket.com become one of the most popular online booking portal among its customers over the years.